Different people have various choices for music. But when it comes to your wedding music, you cannot consider only your choice. You need to think about your guests too who may have a varied liking. And in that case, a wedding band is a perfect fit. A wedding band can present a variety of music and create an atmosphere which can be enjoyable for all. A primary duty of your wedding band is to bring joy first by playing great music, and secondly by working harmoniously with other vendors, and getting well with the wedding party. That way, while choosing a wedding band it won’t be sufficient only to check their performance. But you will need to check their overall temperament too. You can get a rough idea upon meeting them, from how comfortable you feel while interacting with the band members. Let’s see what else you should check. Was the band’s demo CD to your liking? Does the band’s song list quite reflect songs and styles you love? Are they willing to learn some new songs for you? How do they personalize their performance to your choice of music? How many ceremonies do they do in an year and how long they are together? 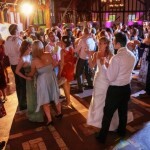 The size of the band – there can be numerous variations, like for cocktails 1 to 3 musicians, for dinner 2 to 5 musicians and even 6 to 14 musicians for dancing, based on the room size, number of guests, your budget and styles you like. Number of female vocalists in the band too makes a big difference because they can bring a variety to the music, though the price may be more. Do they offer custom size of band according to your needs and budget? Are they able to help you regarding finding what you need and thus in decision-making? What is included in the price? Check if the sound engineer, sound system, planning meetings, learning new songs, meals for the band, parking etc are included in the price or not. Are you looking for constant live music? Usually the band is given breaks and some recorded form of music like an iPod or CD is played during the breaks. Once you book your wedding band, next you should plan your music. This is perhaps one the best times for you to know each other as a couple, because your choices get cleared, you come to know about the decision making ability of your better half, and the most important, how much do you respect the other’s choices and decisions. What can the bandleader do? S/He can help you to search through the latest hits, classics and the plethora of music, and make the evening that you both can enjoy thoroughly together. Choosing music for your first dance depends on many important things. Do you get enthralled with the song? Does it make you smile? Does it create love in your heart that makes you think of your beloved sweetheart? In short, it should make you feel that it is played for you. The lyrics should also be considered and should be perfect for the occasion. Of course, you cannot expect to have every component of the song to be up to the mark, but overall you should feel comfortable and the massage in the song should reflect your mood. How long will you dance? You may choose “Stairway to Heaven” for your first dance, but it will go for 8 long minutes to dance on only one tune. Find a song of suitable length or discuss with the bandleader about adjusting the length by cutting down some verses, etc. If you are not very good at dance or are still learning, don’t forget to inform your band regarding how slow or fast you want the song to go. Send an MPS of the edition you are practicing to the bandleader. If you are particularly fallen in love with a certain version of a song, like “The Luckiest” sung by Ben Folds, you can have it played in on iPod or a CD. This is a critical component of music planning. Playing classic styles like classic rock or jazz early in the evening may be helpful in including senior guests. You should decide on when to transit to contemporary music during your planning meetings. There are some great tunes of the 80s, 90s and 2000s in the first set which won’t frighten your grandparents. The ability of the bandleader to clearly sense what both you and your guests want is an important quality to consider, because it will decide how the music ramps up. Also the bandleader must be flexible enough to pace the music the way you want, but at the same time, advising you about the pluses and minuses of the various approaches so that you are able to make an educated decision about the mood of the evening. A good bandleader can help you decide your reception’s timeline. The flow of the evening can be kept on with a variety of options. You will need to make a decision upon your choice. There may be exceptions to these rules, e.g. if pictures offsite are in the plan, cocktails can extend more than an hour, or dinner can vary in length based on the number of courses, and dancing time too can be adjusted if you and your guests are in a mood to have fun and enjoy a great party! Check out this wedding band LastRequest.net – London’s best live band! They have a fantastic track record of playing for more than 300 weddings since 2005 in the UK and Europe, along with providing corporate music entertainment in various places. You can visit their site to know about their excellent performance and enjoy their music and videos, some of which are given in this article too.